Babywearing takes on many shapes and forms, and using woven wraps is one of the most versatile ways to wear your baby. Woven wraps are long, narrow strips of woven cloth made from various textiles that offer different qualities on wrapping a child to their caregiver’s body. Woven wraps do come with a bit of a learning curve, but with practice you can adapt the wrap so that you and your baby are comfortable. Most wraps are able to support baby from birth to toddler, so they make a great investment on your time in babywearing. The Wrapsody Breeze is a lightweight woven wrap made of gauze cotton. The lightweight, breathable fabric is complimented by the beautiful hand painted batik design which makes each and every wrap completely unique! This wrap is perfect for babywearing in hot weather and throughout the rest of the year too! The Wrapsody Breeze comes in 11 colorways. The Pierogie Mama and her sister in law love the Wrapsody Breeze Haumea, as her sister in law just moved to San Diego and was looking for a good wrap to wear her newborn in. Read why Haumea is a special wrap for expecting mothers and it gets 6 thumbs up! Has a self storing pocket on the end, making it easy to store in your diaper bag! 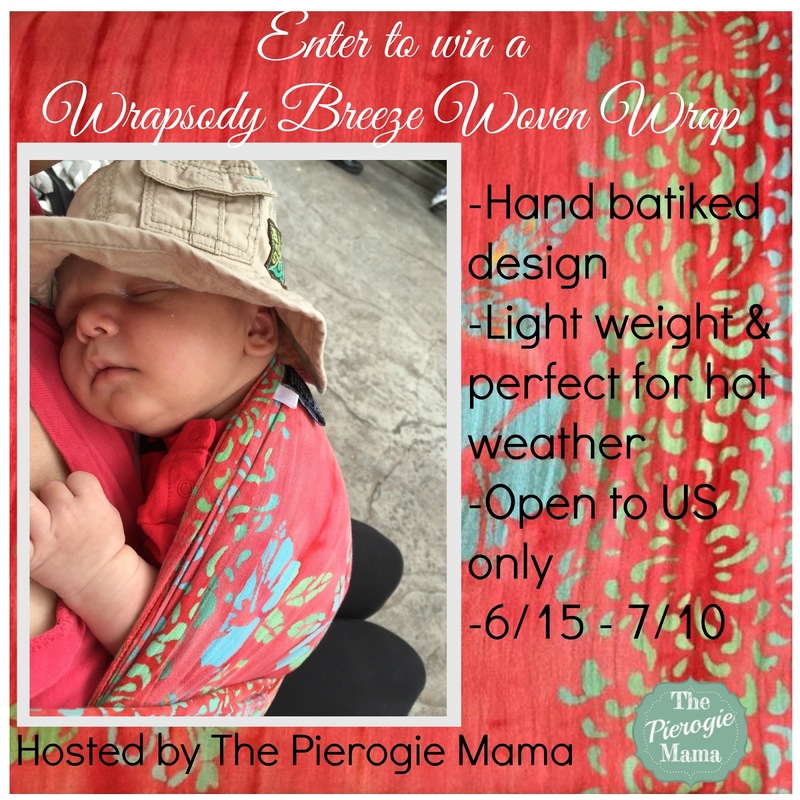 Now you can enter to win a gorgeous Wrapsody Breeze woven wrap in your choice of available colorway and size! See giveaway details in the widget below. Disclousure: This giveaway is hosted by The Pierogie Mama. It is not affiliated with Facebook, Instagram, Twitter, Pinterest or any other social media platform. Participating bloggers are not responsible for prize fulfillment. Please email thepierogiemama@gmail.com with any questions regarding this giveaway or if you’d like to sponsor a future giveaway or blog post. Please see giveaway widget for full giveaway details and eligibility. What Kind of OREO Creations Are In Your Dreams? I’ve never tried a wrap, but would love to with my next baby! This one is beyond beautiful!! I haven’t tried them, but would love to. My son is a furnace, and im sure the baby on the way will be as well. Cant wait to start baby wearing. This looks amazing and its beautiful. This is such a beautiful wrap! I have never tried a wrap, but I think this would be the perfect one! Such a Pretty print! I’d love to win one of these, Noa is my favorite. Thanks for giving us the chance to possibly try a new wrap we might otherwise not be able to. My new baby is coming in August! This would be perfect!